The Southeastern Spine Institute (SSI) campus is located in Mount Pleasant, South Carolina, which is a northern suburb of Charleston, SC. Just over the bay from Charleston proper, Mt. Pleasant is close enough to the city to allow you to visit, often, during your stay at SSI. As it turns out, you can find lots to do in historic Charleston, SC. Founded in 1670, Charleston is approaching its 350th birthday. So not only does the city boast some of the longest history in the Southeast U.S., but it also has some of the richest. From the early settlement and thriving seaport in the 18th century to the shot on Fort Sumter that started the Civil War to its link with the US Navy and its success as a tourist destination, Charleston has many worthwhile sights. If you come to the Southeastern Spine Institute for physical therapy, pain management or surgery, you may have to spend several days in the area. Before and after your treatment, take extra time to see the “Holy City,” Charleston’s nickname. As an added advantage, you don’t have to exert yourself while sightseeing. You can get to many of these places by car, so as long as you can ride, you can entertain and educate yourself about Charleston, SC. Start your tour wherever you’d like. Remember you don’t have to cram all these sights into one day. The idea is to get out of your hotel room while you recover. But don’t overdo it! 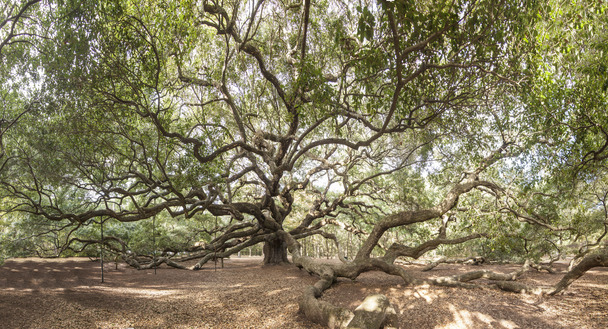 Angel Oak isn’t just a big old tree; it’s The Big Old Tree. More than 25 feet around and 65 feet tall, it’s said to be 1,500 years old. You can find it for free at 3688 Angel Oak Road on Johns Island. Call 843-559-3496 for more information. Boone Hall Plantation dates from 1681. Covering 783 acres, the buildings and grounds are accessible via a guided tour. Call 843-884-4371 or journey to 1235 Long Point Road right in Mt. Pleasant. Charleston City Market is open every day except Christmas. It features local crafts and cuisine. In operation since 1830, it’s a great place for a leisurely walk. Go to 188 Meeting Street and plan to spend some time there. Charles Towne Landing is home to the original colony that became Charleston, SC. You’ll find lots to amuse and amaze you at 1500 Old Towne Road. Call 843-852-4200 for hours and more. Dock Street Theater is America’s oldest theater. Ever since 1736 its stage has entertained audiences. Located downtown at 135 Church Street, the theater’s open on most weekdays. Call 843-577-7183 for more information. Fort Sumter National Monument was the scene of the first battle of the Civil War. You must take a ferry to the fort from the Fort Sumter Visitor Center at Liberty Square and Patriots Point. Call 843-881-7117 for tour information. Magnolia Plantation & Gardens features a 17th century plantation and extensive garden. You can ride a train or boat on a tour of the estate. Call ahead at 843-571-1266 or just go directly to 3550 Ashley River Road. Old Exchange and Provost Dungeon is one of those tourist traps that are worth the visit. At 122 East Bay Street, the museum offers many entertaining historical stories and enigmas. It’s one of Charleston’s oldest buildings. Call 843-727-2165 for more info. Old Slave Mart Museum traces the dark history of slavery in the United States. Located at 6 Chalmers Street, the museum is a solemn educational experience that requires a lot of reading. Call 843-958-6467 for more information. Patriots Point Naval & Maritime Museum focuses on more recent history. The Museum features several World War II-era naval vessels. You can buy tickets online or at 40 Patriots Point Road in Mt. Pleasant. Call 843-884-2727 for more information.